The Word Web App contains features beyond just adding and modifying text-based content. In particular, you can work with styles in order to standardize the look and feel of your document and tables to create rows and columns. 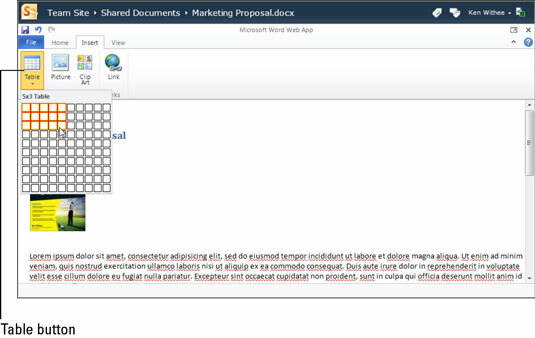 The styles let you format a document by selecting a predefined style rather than going through a manual process. For example, you may want your headings to be larger font and a different color. You can, of course, type the text and then highlight the text and make it bigger, and also change the color, but using this method is a lot of work for every heading. A style allows you to simply click the Heading style to make the change. 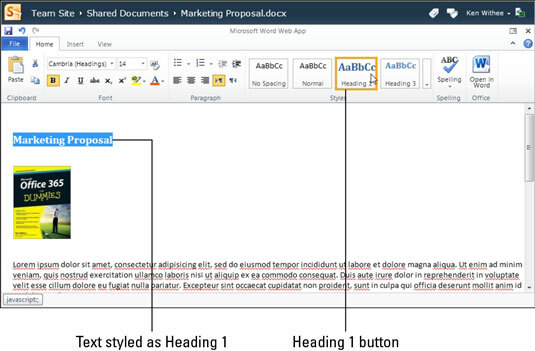 The Insert tab displays the Ribbon that allows you to insert items into your document. When you select the Table button, you are presented with a grid that allows you to visually choose the number of rows and columns you want to include in your table. Highlight the number of rows and columns you desire for the table and then click the left mouse button. The table is automatically inserted into the document. After the table is created, you can add content to the cells of each column. The table provides a lot of flexibility in the look and feel and layout of the content in your Word document.